The Strange High House in the Mist is one of my favorite Lovecraft stories. I like its *feel* of certain places and spaces and textures and locations. Lovecraft’s stories make me think of the props closet of some vast theater, of a crumbling estate with overgrown gardens, of books of old botanical and zoological illustrations, old houses stuffed with bric-a-brac and ornate finery. I was inspired to read this story, back when I was really young, partially by some old drawings in the fanzine “HPL” edited by Meade and Penny Frierson, of which my dad owned a copy. The artwork, like Lovecraft’s writing, fascinated me with its intricate detail. Incidentally, although Kingsport was apparently inspired by Marblehead, and I used it for photoreference, I’ve never seen cliffs quite as Strange-High-House-like as the ones north of San Francisco in Marin County, particularly the green cliffsides above the Golden Gate Bridge. (There are some great cliffs on the highway south from San Francisco towards Santa Cruz, as well.) When I actually saw the Marblehead cliffs for the first time, I have to admit, they’re not that tall in real life. At the risk of sapping the magic out of The Strange High House (and there is still a lot of ambiguity), the story is, I think, pretty obviously about Lovecraft’s marriage. We don’t learn much about Olney’s home life — such details would be unthinkable in a Lovecraft story — but it is one of those few Lovecraft stories (another is the IMHO inferior and emo “The Quest of Iranon”) which sets a boring, mundane ‘normal life’ against a poetic, artistic ‘extraordinary life’… reality vs. the dream. Like “Dream-Quest”, “The Strange High House” was written shortly after Lovecraft’s return to Providence from New York, his retreat from getting a job and being married and all those other markers of adulthood which he failed at. In “Iranon” the dreamer was a young starving bachelor; in “Strange High House” the dreamer is a burdened adult who manages to do what Lovecraft didn’t. Beneath all its cryptic elements, at its core “Strange High House” is “Iranon 2”, without the same level of beat-you-over-the-head moralizing. (It’s also interesting to note that Lovecraft’s vision of the dreamlike fantasy waiting inside the house, the end-of-the-rainbow mystery, bears a certain similarity to just hanging out with all his friends in some big nerd party in the sky.) 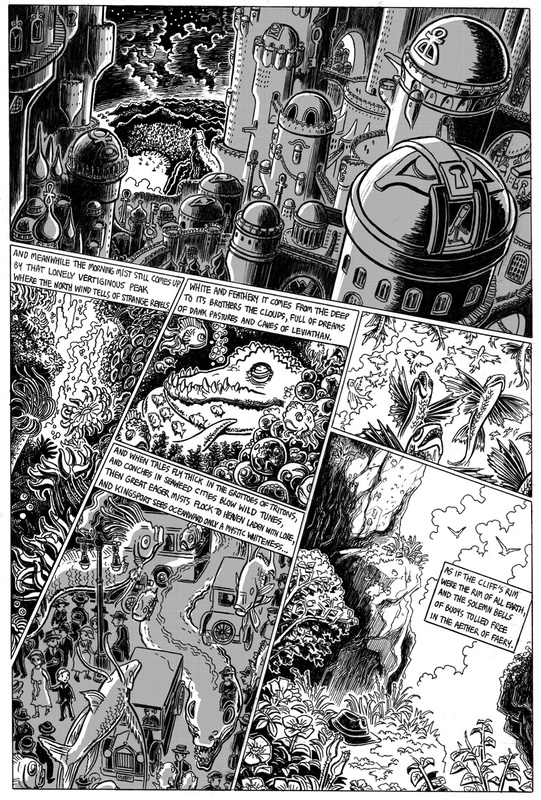 Kenneth Hite, in his Tour De Lovecraft, points out that “Strange High House” is unique among Lovecraft’s tales in that it leaves a certain ambiguity as to whether the protagonist’s final fate is something good or bad, an ambiguity which I’m not sure if my adaptation captures. Personally, the ending reminds me very much of the ending of Lord Dunsany’s excellent The King of Elfland’s Daughter. So that’s the end! But what’s next? Well, I have two more Lovecraft comics, for starters. One of them I am drawing at the moment. The other one I drew several years ago but I am sold out of the minicomics and it hasn’t been online since I drew it. Over the next few weeks I’m going to be posting that comic TWICE weekly, on Mondays and Wednesdays, starting next week! So please stick around and come on back on Monday for the next in my Lovecraft trilogy… THE WHITE SHIP! NEXT UPDATE: Monday, January 24! Congratulations, Jason! You did it and on schedule, yet–well done! Alec Stevens did an adaptation of THE WHITE SHIP over 20 years ago. I can’t wait to see your version! There are more comments to make about STRANGE HIGH HOUSE but I think I’ll reread the print version first and mull it over in my mind a bit. See you on Monday! Awesome finish to this Strange and unusual tale! And great news that more of your HPL visions are on the way. Ready to board the White Ship…. I so much appreciate you putting your time into this, Jason. It’s been a pleasure seeing your artwork. I can just get lost in it sometimes. It has a real sense of “life”, with so much going on that you really have to study parts of it at a time before going back to the whole. Glad you came back to the project. You ever think about trying Kickstarter? Your work is definitely the kind of work I think would appeal there. Just look how well Cursed Pirate Girl did. If you were willing to do a large project, you could possibly make some serious cash. And he best part is that you’d know how much cash you were guaranteed before putting the time into actually doing the project. Oops, forgot to check the box to get followup comments. Posting so that will take effect. This last page is great! And congratulations on finishing the story! What are you thinking of changing? The ambiguity isn’t quite there, I think, because of page 15, in which the kids are obviously so eager to follow Olney, with such joy on their faces. This means that they must have heard something good, most likely from the other kids who were there (especially since they’re going in groups, not one-by-one like Olney). Other than that, it is pretty ambiguous. I’m really looking forward to the new story you’ll have here soon. By the way, there’s a slight square grid pattern to the greytone here as well. @Esn – Yeah, it’s an artifact of how I did the greys on these pages. I’ve figured out a better way to do it, though, so future Celephais pages should look cleaner. Bravo! I absolutely loved the story when I first read it, but more because of the concepts and structure. I was not quite able to connect with the actual words. With your pictures, you execute on the story far better than Lovecraft did, and I no longer feel ashamed of loving this story as much as I do. Thank you! Thanks for the kind words! :) I hope you like Celephais too. BTW, I’m doing some weird site updates right now, so apologies if both of our comments vanish!